The Most Rev. 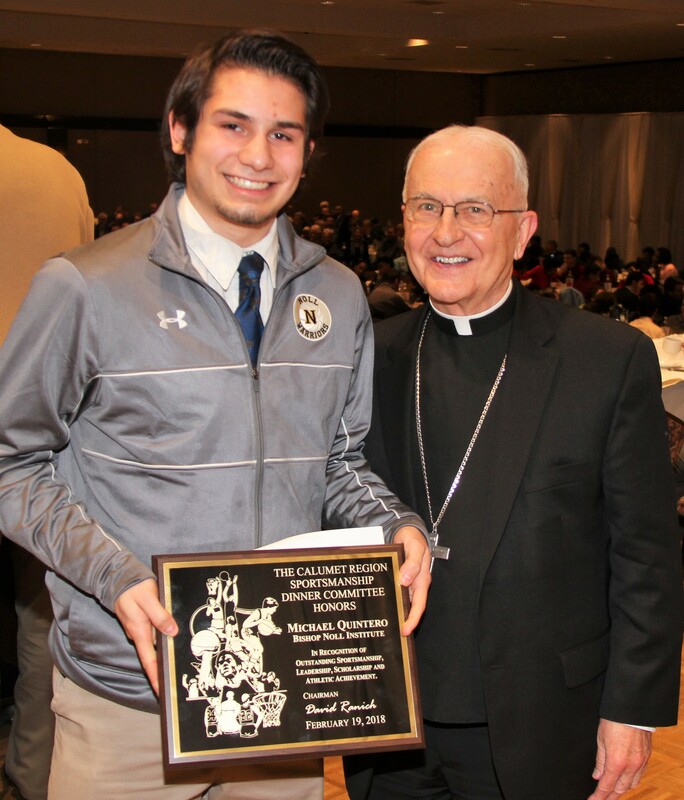 Dale J. Melczek, bishop emeritus of the Diocese of Gary, congratulates Bishop Noll Institute's Michael Quintero after the BNI senior received the Leadership Award at the 64th annual Calumet Region Sportsmanship Dinner at the Halls of St. George in Schererville on Monday, Feb. 19. Every year at the Sportsmanship Dinner, which precedes the IHSAA boys basketball sectionals, one player of the approximately 400 in attendance from 30 region high schools is recognized with the special Leadership Award that comes with a cash scholarship for college. 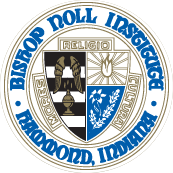 This year's honoree, announced at the 64th annual dinner, was none other than Bishop Noll's salutatorian, Lilly Scholar and Warrior co-captain, Michael Quintero. Michael, of Hammond, is a captain of the BNI basketball and cross country teams and has been a student retreat leader. He also serves as a Eucharistic minister at St. John the Baptist in Robertsdale and volunteers in the parish's Phyre Ministry. Michael attended St. Catherine of Siena and St. John Bosco schools before enrolling at Bishop Noll. He plans to attend Purdue University in West Lafayette and study mechanical engineering. Bishop Melczek offered the invocation and the benediction at the dinner.